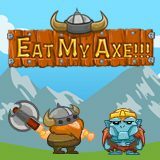 In this physical game you should help a viking to destroy all the zombies with his axe in the least number of throws. Do not hurt other vikings. Games Similar Eat my Axe!! !